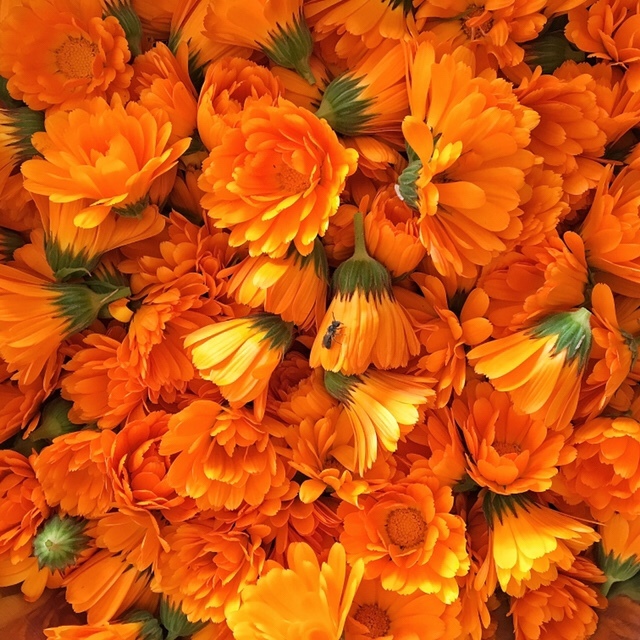 The name Calendula is derived from the latin calends meaning the first day of the month – referring to the plant’s ability to flower almost continuously throughout the year. It has been used for thousands of years by different cultures as herbal medicine. Calendula has a solid history of treating wounds, cuts, grazes. Science has backed up this history, showing that it may be beneficial for helping to heal both internal and external wounds and inflammation including gastrointestinal inflammation/ulceration and burns. Calendula is a herb that is tolerated well by almost all people except a small minority who are sensitive or allergic to food or plants of the daisy (Asteraceae) family of plants. I put away a few batches of dried calendula flower a year. I like to dry the flowers and petals before using them in herbal preparations. Taking the water content out helps to ensure that they are less likely to grow moulds. Drying also allows you to store the petals and flowers easily, always on hand for making teas, lotions and potions. A simple water infusion of calendula flowers or petals can be used as a tea or applied to the body. You simply place 1 – 2 tsp (1 – 2g) of dried leaves/flowers (3 – 4g for fresh) in a teapot. Infuse for 10 – 15 minutes and then drink throughout the day. Tea – calendula tea has been drunk for centuries to aid in the healing of inflammation and ulceration of the gastrointestinal tract. Check with your healthcare practitioner before drinking calendula infusion on a regular basis. Mouthwash and Gargle– aids in the healing of gingivitis, ulceration, thrush and other minor infections of the mouth and throat. Also useful for tonsillitis and pharyngitis. You can swish a cooled infusion of calendula around the mouth, making sure it is being pushed through the teeth, gargle and then spit out or swallow. Eye infections – for minor eye infections you can soak a cotton ball in cooled calendula infusion (strained through a very fine doubled cloth or doubled over clean nut milk bag) and apply liberally around your eye with your eyelid shut. You will need to make a fresh infusion every day and do not double dip with the cotton ball to prevent cross infection. 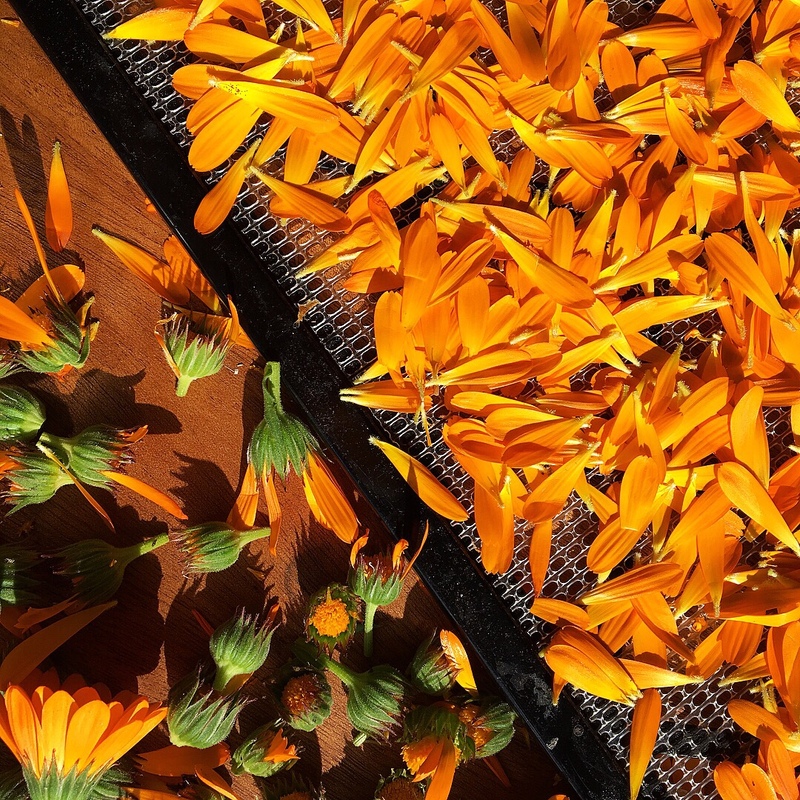 Dried calendula petals, easy to store and ready for use. 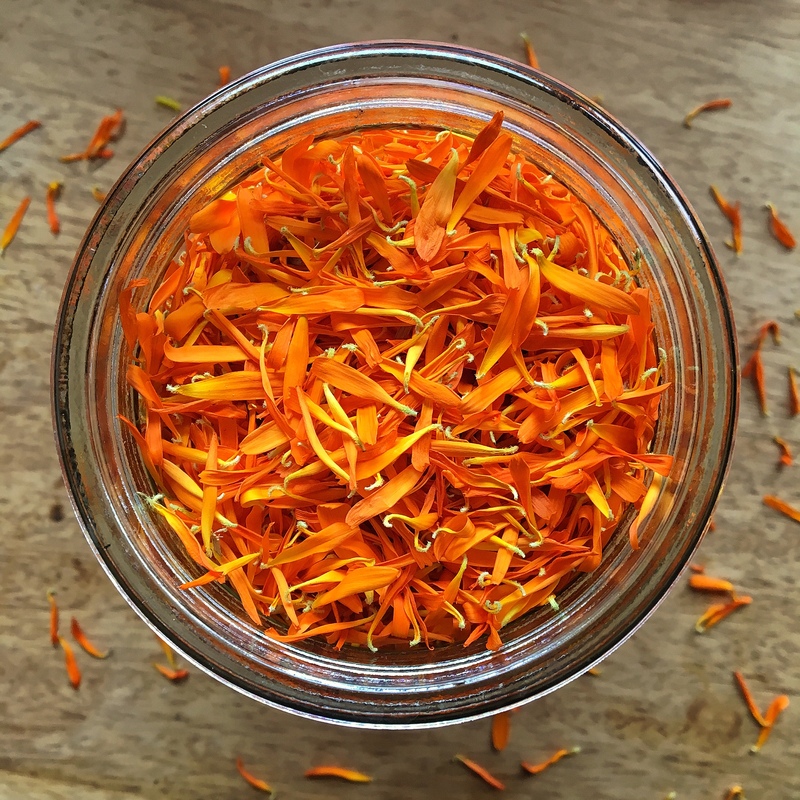 Calendula infused oil is super easy to make, you can find out how to make a batch here. Oil infusions are great for rubbing directly into your skin or for making balms and salves. Clean, sterile glass jars and lids to hold approximately 300mL of balm. Over a medium heat add the beeswax and oil to a double boiler (see note). The beeswax will slowly dissolve into the oil. Stir with a whisk to combine. When the beeswax is almost dissolved remove from heat and allow it to cool for a few minutes, but not so long as for the balm to harden. Add the honey and essential oil and stir again. Pour into a small jug with a fine spout. You can also use a syringe if you prefer. Fill the jars. You will need to work quickly as the balm will harden. Between pours stir the balm to ensure the honey does not settle in the bottom of the jug. Note: If you do not have a double boiler simply pop a stainless steel or heatproof glass mixing bowl over a saucepan filled to a quarter with water and brought to a simmer. Make sure the bottom of the bowl does not touch the water. I have a lip balm recipe that you can make for chapped, cracked lips that also works a treat. Calendula flowers are edible and I always think of edible flowers as salad bling! I also scatter the petals over my carrot and zucchini cakes. Dried petals brighten up my carrot cakes too! Dried petals and whole flowers are a wonderful addition to bath bombs (recipe here), bath salts and other lovely things. No doubt you can find many decorative uses for them too. 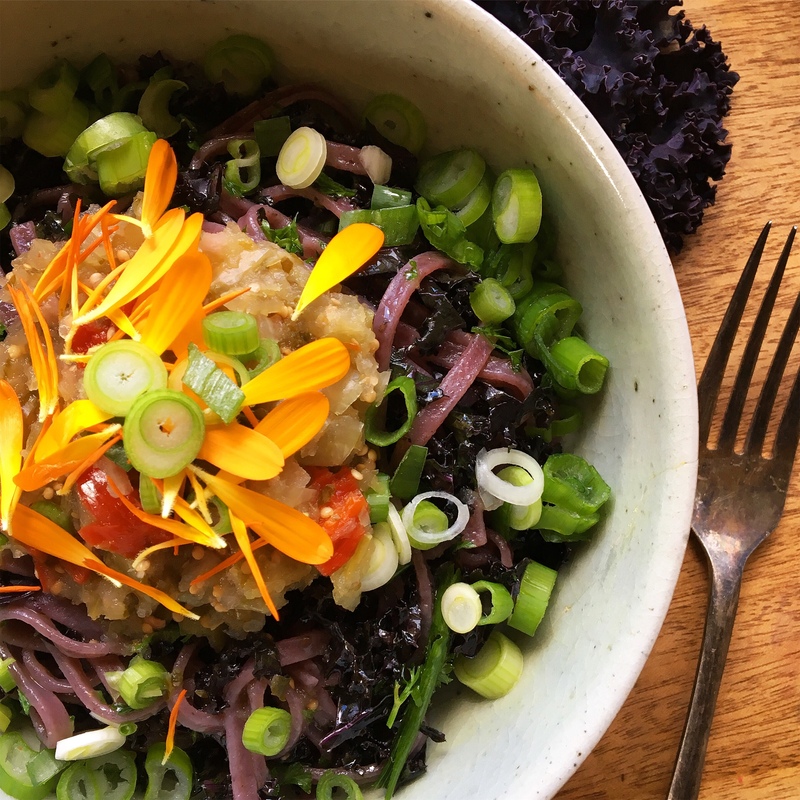 Calendula Petals Make Healthy Salad Bling! Do you have any favourite ways to use these wonderful flowers? You have done a great job, I like your passion towards blogging. It is very useful…. I have also written about Calendula on my website. If you have time please check it out…. Thanks Vikalp. Calendula is such a versatile healing plant. I am popping over now to check out your post.